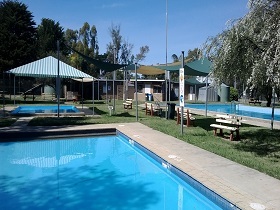 Harcourt Outdoor Swimming Pool is a seasonal pool open from December to March. It is currently managed by the Bendigo Regional YMCA and is open for recreation water activities and lap swimming. It features three different size pools including a wader and learner pool. Harcourt Swimming Pool is now closed and will reopen in December 2019. The management and operation of Harcourt Swimming Pool is undertaken by Bendigo Regional YMCA Youth Services Incorporated.